Our family participated in a story done by The Tennessean newspaper about simplifying Christmas yet trying to make it more meaningful each year. 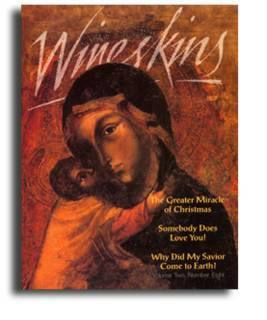 I put up all the articles from this 1994 classic Christmas issue of Wineskins. For my readers on this blog, I’m offering you an extended trial of the magazine if you’re not already a subscriber. We offer a 10-day free trial, but I’ll give you from now till January 31, 2005 to look at these Christmas articles and begin to see the redemptively challenging articles that we’ll put up beginning January on Christian Ethics. Use this user name: “gracemail” and password: “wineskins” . . . I made this same offer to Edward Fudge’s GracEmail subscribers, thus the user name. Merry Christmas and blessings of Advent (Christ’s coming as Emmanuel) to you and yours. Tune in to NPR’s Weekend Edition with Scott Simon to hear IJM founder and president, Gary Haugen, and David Makara Ngure, a young man helped by IJM. Ngure shares his story of police abuse and the relief and justice IJM brought to him when he was wrongfully accused and imprisoned. Haugen also talks about IJM’s work around the globe to rescue the oppressed. In the next few weeks Haugen will be appearing on several major media outlets promoting his new book Terrify No More, a dramatic telling of IJM’s operation in Svay Pak, Cambodia where dozens of girls were rescued from a brothel community. This is one of the most important disciplines of humanity: to creatively struggle to see through the eyes of our creator, to see what he sees, view the world as he does, love others as God loves. Ironically, we come closer to this goal by seeing through the eyes of others, and in so doing we more nearly accomplish the Golden Rule of doing unto others as we would have them do unto us. Friend and mentor Terry Smith has taught me the “Platinum” Rule, a corollary to the Golden Rule: Do unto others as they would have you do unto them. This principle has set my marriage aright when it was turbulent. This principle has saved me from trying to love someone the way I think they might want to be loved but nowhere near how they truly want to be loved. Our interpretation of Jesus’ Golden Rule has been flawed at times, because we love as we want to be love, not thinking that perhaps this person may not enjoy being loved or need to be loved in the same way I need to be loved. I believe Terry’s interpretation may bring us closer to Christ’s intent. In other words, we see through the other person’s eyes to know how to love them. Here are a few words I’d like to drop out of today’s lexicon of speech. Take a look then tell me some of yours. Ilk – As in “You know, people of that ilk.” This word and people of that ilk who say it need to spend some time in McDonalds or some greasy spoon and get the blank stares of normal Americans–outside of academia–when they hear them say words like “ilk.” Say what? Milk? You want white or chocolate? Ergo – As in “Our economy is global, ergo Wal-Mart is buying more products from China and nobody seems to care anymore that stuff is not Made in the USA.” If one thinks “therefore” is a stuffy transition word and has taken to saying “ergo” instead, they’re full of stuffing. Especially – As in “I love Sonic, especially their onion rings.” Especially ain’t a correct form. It’s “specially,” unless you’re trying to add a Latin flare to your speech. In that case, get a Zoro hat and do it all the way. “Remember those in prison as if you were there with them; and those who are being maltreated, for you like them are still in the world” (Hebrews 13:3, NEB). Someone in China handled each of the little white lights on your Christmas tree. Many of those assembling the lights, crimping by hand without tools, are prisoners. Many of those prisoners are held unjustly and persecuted for their faith in Christ. In fact, according to WorldServe and Michael Card, for some reason many of those who are putting together lights are persecuted Christians. Michael Card, WorldServe, and the ministry of the late Larry Burkett are trying to make us aware of persecuted Christians worldwide with the “Lights of Christmas.” The idea is to be reminded when we look at the lights strung across houses, trees, yard decorations, to think of and pray for these persecuted prisoners. Our five-year-old, Jacob, ran through the house the other day shouting, “Happy Kwanza! Merry Christmas! Happy Hanukkah! The goal of our children’s school related to this holiday season was to make the students aware of and help them respect all the various forms of celebration. Anna, our eight-year-old, danced in a Jewish Hanukkah dance in a program called “A Wonderland of Holidays.” A muslim boy read a description of Ramadan, other students read descriptions of Christmas and Hanukkah. I remember a Jewish boy I knew in my public grade school. In the 70s in Oklahoma we sang Silent Night and I remember bulletin boards about Christ’s birth, but Scott Schaffer had to sit out while the rest of us sang Christmas carols and celebrated Christmas alone. Today, public schools are still allowed to talk about religions, as long as major representative religions are given equal time. I wonder about this experience my children are having. Does this openness and understanding benefit them ultimately? We celebrate Advent and Christmas as a celebration of Christ’s birth at home, so I think their awareness of others around them, what they celebrate, is important–as long as we are teaching our beliefs strongly at home. What do you think? What’s your experience with schools yourself and for your children? Seems to me one of the questions near the surface during the election and now salient in our culture is, “What is morality?” There is a great rift between those who define morality as a set of rules for clean living and those who define morality more as social responsibility. For example, on one side of the rift are those who primarily view ethics in terms of personal morality. I spoke to one lady who said she abhors immoral gay marriage yet does not view war as immoral. She perhaps would represent the side that views morality as correct personal sexual and clean living choices based on how she views commands in Scripture. On the other side are those who view morality as a social value. I know another person who calls the war in Iraq and killing of tens of thousands of Iraqis, many innocents, immoral. The same person believes rejection of the Kyoto Protocol as an immoral rejection of care for the environment. It seems painfully obvious that many people, Christians included, do not know how to ground and frame ethical decisions and beliefs. We need help. I believe the Jesus ethic of Shema plus loving your neighbor as self is the beginning place for Christians toward an ethic of both personal and social morality and responsibility. Ethics is a huge area of needed thought and dialogue today. In the next six weeks I’ll be exercising my ethics muscles in researching and talking on a daily basis to thinkers, writers, doers on the theme of ethics. In 2005 Wineskins will publish an issue on ethics in order to provide a resource for knowing how to ground and frame and discuss and live out an ethical life. I’m open to your input on ethics and on any resources you can direct me to. 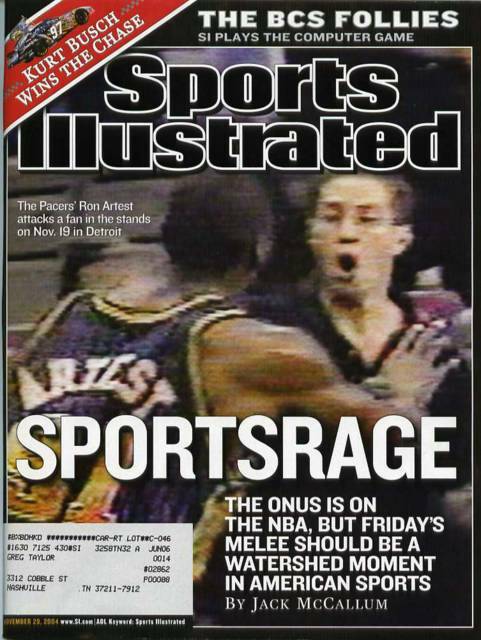 “The Punch” happened twenty-seven years ago today, December 9, 1977. Lakers power forward Kermit Washington hit Rudy Tomjanovich with a punch so brutal and violent it almost killed him. It was the beginning of the end of both Washington’s and Tomjanovich’s basketball playing careers. One of the great sports writers, John Feinstein, wrote a book about what this 1977 brawl did to the NBA and to the lives of two players whose lives were changed forever. Feinstein’s book is called, The Punch: One Night, Two Lives, and the Fight that Changed Basketball Forever. I’m in the middle of listening to it on tape in the car. Feinstein sets up the back story of the league in the late 70s, the lives of Washington and Tomjanovich, and the roller coaster aftermath that has been their lot. 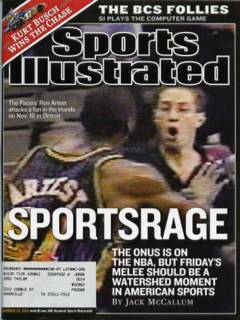 Tomjanovich went on to be a successful coach of the Rockets and the 2000 USA Olympics team. Washington had much less success and many turned him away, not wanting to be associated with him. But Feinstein tells a story of redemption, of a life turned around in spite of the awful chain of events that the one second punch set in motion. I want to tell you about a friend who has begun regular visits to the Republic of Moldova, an Eastern European country that is the second smallest and the poorest of the former Soviet Union states. Her name is Marilyn Swing, and she is a sister in Christ with me at the Woodmont Hills Church in Nashville. The mayor of Nashville praises her highly for her twenty plus years of service in city government, but she has her heart in Moldova now, too. Increasingly as the world becomes “smaller” with transportation and more short-term mission opportunities, we find ourselves in the position of Marilyn, longing to serve both the people in our locale but also in places far away as Moldova is from Nashville. Below is an excerpt from her latest letter. Our small group plans to help them with some of the items she’s requesting for orphans to span the long freezing winter. I’m asking you to either explore this effort or find a mission locally that you can help this winter. From Marilyn Swing . . .
My time in Moldova was spent with 175 orphaned children at a camp near the capital city of Chisinau. I was welcomed at camp each morning by dozens of smiling faces and the open arms of sweet children whose entire worldly possessions were stored in a small box under their beds but who freely offered their most treasured possessions to me as an expression of love and friendship. The days at camp were filled with soccer and volleyball, crafts, singing, hygiene sessions, praise-and-worship services, and Bible lessons–and there was also a good amount of “down time” to relax with the children and talk about the things that were on their tender young hearts. They wanted to hear about America — our favorite pastimes, the names of our pets, the kinds of activities that American families enjoy together– and they asked challenging questions about their future, my faith, and how Jesus could be the answer to the overwhelming issues they will face for the rest of their lives. It was heart-breaking to hear so many of the children tell me that they had no parents, or that they had been left at the orphanage by a parent and were hoping for that parent’s return, even after 6-7 years. To have children ask if they could call me “mother” because they had no parent reinforced in me the importance of my work there and the significance of helping these little souls learn about Jesus as the only true hope they will ever have in the dire circumstances of this impoverished country. I spent every waking hour talking with, listening to, being interested in, and loving these inquisitive, creative, beautiful children whose sole daily support system–except for an occasional kindness from tired, very overworked teachers– is their fellow orphans. Since the fall of the Soviet Union, the orphan population in Moldova has doubled — parents leave the country to find employment, they fall into a life of alcoholism or crime, or they die at an early age because of poor health and unsanitary living conditions. The children are left behind, abandoned and alone. The Moldovan government provides little more to these children than basic housing and a limited education at the orphanage. The children are furnished no coats, hats or gloves to survive winters in a country located at the latitude of Minnesota. Each year a child is given two shirts, a pair of pants, and one pair of socks; every TWO years the government will give each a pair of shoes. I will be returning to Moldova on January 3rd to celebrate the Christmas holiday with the children. I plan to carry as many items of warm clothing for the children as I can gather, along with money to meet special needs such as shoes, mittens, medicines, warm blankets, and to build more beds. I need your prayers and your support to assure that my journey will be a safe and productive one, and that my love, hugs and my encouragement for the children can be enhanced by meeting some of their basic winter needs. Your contribution will make a difference in the life of an orphaned child. Monetary donations are tax-deductible if made payable to CERI (Children’s Emergency Relief International). You may mail checks to me for delivery to CERI; for donations of clothing, medicine or other items, I will be glad arrange pickup at your convenience. I have met and love these children, and you can be assured that 100 percent of your donation will be used to meet the direct needs of these children. If you’ve never read (I know most of us have seen) Charles Dickens’s A Christmas Carol, don’t wait another Christmas to read it. If you love great writing and tale telling, here’s one of the best. Garrison Keillor’s Prairie Home Christmas does a fun reversal of the story with Scrooge doing acts of kindness from the beginning and ruining the whole story and putting actors out of work at Christmas. While I’m talking about scrooges, another of my favorites about a scrooge redeemed is George Eliot’s Silas Marner. The following is from a great audio web site called Sermon Index. If you ever wished there was a site that archives a wide variety of sermons, there it is. Tell me about others if you know them. Two other favorites of mine over the years are Preaching Today and Mars Hill Audio. C.T. Studd was an outstanding County and All-England Cricketer. He was a freshman at Trinity College, Cambridge, in 1879-1880, and took a degree in law. By that time he had been challenged to a missionary career and, forsaking his cricketing fame and the family fortune, he followed Hudson Taylor to China. He returned 21 years later, broken in health, after serving in China and India. Unexpectedly he received a new and very distinct call to the heart of Africa. At 53, leaving his invalid wife in England, he set out in utter reliance on God’s promises. His answer to all who questioned the wisdom of his action was found on a postcard on his desk: If Jesus Christ be God, and died for me, then no sacrifice can be too great for me to make for Him. Some sayings The best training for a soldier of Christ is not merely a theological college. They always seem to turn out sausages of varying lengths, tied at each end, without the glorious freedom a Christian ought to abound and rejoice in. You see, when in hand-to-hand conflict with the world and the devil, neat little biblical confectionery is like shooting lions with a pea-shooter: one needs a man who will let himself go and deliver blows right and left as hard as he can hit, trusting in the Holy Ghost. It’s experience, not preaching that hurts the devil and confounds the world. The training is not that of the schools but of the market: it’s the hot, free heart and not the balanced head that knocks the devil out. Nothing but forked-lightning Christians will count. A lost reputation is the best degree for Christ’s service. It is not so much the degree of arts that is needed, but that of hearts, loyal and true, that love not their lives to the death: large and loving hearts which seek to save the lost multitudes, rather than guard the ninety-nine well-fed sheep in the British pen. I don’t understand his decision to leave his invalid wife but perhaps his longer biography explains more, and I intend to look that up. We were able to “accomplish” most of these. I became one of those parents yesterday . . . The forecast was freezing weather. I made my three children wear their coats, much to their distress. They all boarded the bus frustrated, worried how they’d fit their coats in their puny cubby or locker. I reminded them that two years ago we ended up walking home at an early dismissal, in the snow, and had they been coat-less that day, the hour we had to walk would have unbearable, frostbite may have set in . . . besides, I used to walk two miles to school in the snow, uphill . . . both ways! Speaking of cold weather . . .
During the cold weather Woodmont Hills Church joins other churches in the community in hosting homeless people to sleep. About ten churches participate so there’s a place to sleep each night during the winter months. I spent last night in the lobby of Woodmont with about a dozen homeless men, eating good food, sharing our stories, encouraging one another, getting a good night’s sleep, some needed wash done, and a good shower. Ronnie, a 45-year-old Black man with one top tooth and most of his bottom teeth, a big belly, a great demeanor, and one of 18 children born to a couple in Memphis, Tennessee who were married 65 years, encouraged me the most. His life wasn’t so “productive” with children and happiness. He and his wife had divorced. He had recently received a letter from his father at the mission. His mother had died two years earlier. His father wanted him to come home. He and another man, Craig, wanted me to write out prayer requests. Well, I didn’t tell you yet about the 12 days of Christmas as I said I would yesterday . . . but I will another day.